1. MR15A design is our self researched micro-registration manual screen printing machine. 2. Adjust the screw handle to move the screen to all directions,very accurate for multicolor registration. 3. Alum table is more durable and high temperature resistance. 4. Double rotary type, screen and table can rotate independently, strong base with caster to move freely. 1. Widely suitable for screen printing tshirts, garments, towel, lether,umbrella and backpack, etc. 2. The printing base and screen can be rotated, and screen plate can turn backward and forward, left andright, which makes the operation easier and postitioning more accurate. 3. Used for printing with heat set ink, rubber cement and other printing inks. All our screen printing machines and spot dryers are proudly hand made in the china. On our carousel screen printing machines, the screens rotate allowing you to select the next colour and so on. On the larger machines (eg. 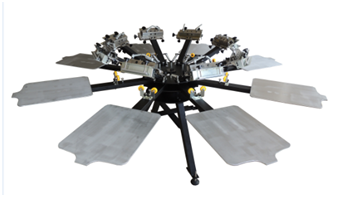 4, 6 and 8 colour floor standing machines), the print beds also rotate independently of the screens. This is important because as your print one colour, you need to rotate the t-shirt (whilst still on the board) underneath the spot dryer to cure the ink before you apply the next colour on top. 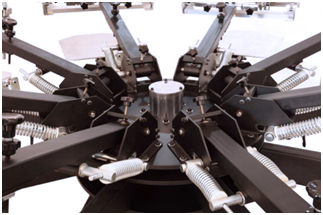 Our carousel machines pack many features only often found on much more expensive machines. For example, they have micro adjustments allowing you to fine tune the settings and to make sure that others colours align up correctly. Also, the screen holder is adjustable allowing you to micro adjust the screen settings and even making allowances for any warped screen frames (this can happened to wooden frames the more you clean and wash them. This is not an issue with aluminium frames). Strong arm tension springs, high quality bearings and all metal mechanism makes our screen printing machines . Office Address: Room #1423-1425, Minjie Kechuang Center Building No.#1, Private Science-Tech Park, Baiyun District, Guangzhou.